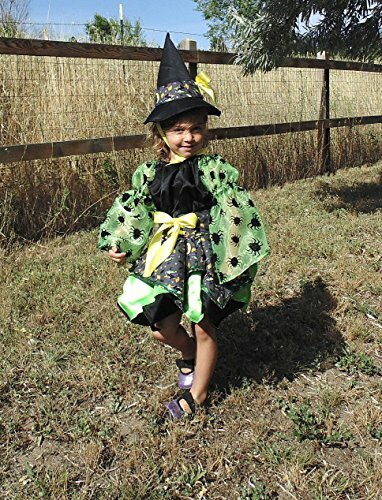 Girls 4T Little Witch in Green by Fru Fru and Feathers Costumes & Gifts at Nicky's Blog. Hurry! Limited time offer. Offer valid only while supplies last. 4 pieces in total: Dress in Green witchy colors and print satin and cotton. top layer of the handkerchief hem skirt is trimmed in green sequins. 4 pieces in total: Dress in Green witchy colors and print satin and cotton. top layer of the handkerchief hem skirt is trimmed in green sequins. Sleeves are green organza with black flocking glitter spiders! This is a 3T but i think this could go up a size and be fine too. Matching Bloomers briefs in green satin, they are not pictured, but are included. Belt is made in matching witch print and brass grommets lace up the front with matching yellow satin ribbon. hat is made in black cotton and has a matching hat band laced and tied with matching yellow satin ribbon. hat also has yellow ribbon ties to secure it in place. please let me know if there are any questions! Girls 3T Little Flower Child Hippie 5 Piece costume with accessories!